Book Discussion Groups: Monthly forums where readers come together to talk about books and the reading experience. Readers’ Advisory for Adults: These may include recommendations of specific titles, authors, or lists of books for particular needs. Movie Matinees & Movie Nights: Shown monthly on the last Tuesday night and Thursday Afternoon of the month. Seed Lending Library Offered Seasonally: Choose up to 5 seed packs at a time- no need to return them, just plant & enjoy! Get the specifics here. In addition to offering FREE seeds, the Emmaus Public Library is proud to participate with Plant A Row Lehigh Valley! In the summer, you can drop your surplus harvest of produce at the collection container near the main entrance. You generosity directly supports our hungry neighbors through Casa Guadalupe, Jefferson Elementary Food Pantry, and Central Elementary Food Pantry. For more information or to sign up on line please visit Plant a Row Lehigh Valley. Need Federal Tax Forms? We do get a limited quantity each year, however they can always be printed directly from the IRS website https://www.irs.gov/forms-instructions . Thanks to Representative Justin Simmons office for dropping a supply of state forms and schedules! Please take only what you need for personal use, as supplies are limited. If you need additional forms please consider making an appointment for help printing from the State or Federal websites. These events and more are publicized in the local newspaper, library flyers, and social media. Please check the website’s Calendar page for more specific events, dates, and times. All questions about the adults’ programs may be directed to the adult services librarian by calling the library at 610-965-9284 x 210, emailing eplcollection@cliu.org or by coming to the library’s front desk. In January 2019, after many years of coordination and cooperation, Emmaus joined with 10 other libraries to form the Lehigh Carbon Library Cooperative (LCLC). 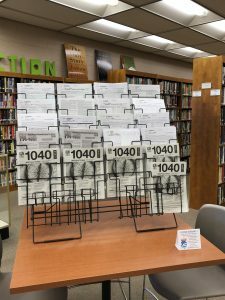 The LCLC gives patrons access to 11 libraries’ collections with one barcode, including the options to reserve and pick up or return materials, renew their library card or register for a new LCLC card at any participating library. LCLC libraries have coordinated borrowing policies, billing standards and card registration procedures to create a seamless experience at any of the participating libraries. To move to the new LCLC card, please bring your existing library card & photo ID in to upgrade to this new resource. If you need helping please feel free to stop by the front desk. You can find the full policies and rules here.